Using the Merge Storyboard dialog, you can merge several small projects and make a big project. This is useful if you have split or extracted your project into several projects in the past, and now you want to assemble those small projects back together. Select File > Project Management > Merge. The Merge Storyboard window opens. In the file browser dialog that appears, browse for and select the project file that you want to add to the current project, then click on Open. The project is added to the list of projects at the top. If you want to change the order of the project relative to the other projects being assembled together, select it and click on Move Up or Move Down. In the end, the scenes of each project being merged together will be assembled in the order in which they appear in the list. NOTE You can move projects above the current project. Their scenes will be inserted before the scenes in the current project. If the caption fields of any project being imported are not horizontally aligned with their corresponding caption field for the current project, select these fields and use the Move Up and Move Down button until they are aligned. If there are new caption fields in the projects being imported that you want to add to the current project, move them down to the bottom of the list, below the current project's caption fields. This will make it so these captions get added as new fields instead of their content getting inserted in existing fields. If you want any caption field of one of the projects being imported to be left out, so that they are not added to the current project, move them down to the bottom of the list, below the current project's caption fields, then click on Remove Caption. Enable the Force scenes numbering option. This will make it so every scene in the project will be numbered in a series after all the projects have been merged together. In the Start scene base name field, type in the number that you want the first scene in the resulting project to have. 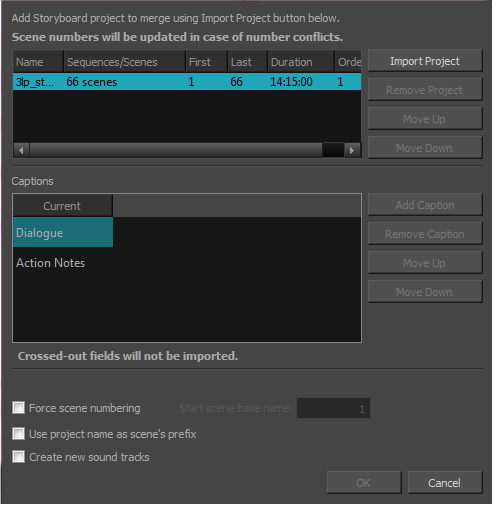 If you are not re-numbering the scenes, you can add the name of each project getting merged into the current project to the name of their scenes, so that you can easily identify which scene came from which project. To do this, check the Use project name as scene's prefix option. If you want to have the audio tracks from each merged project to be imported into separate audio tracks in the resulting project, check the Create new audio tracks option . Otherwise, the audio clips from the merged projects will be inserted in the existing audio tracks of the current project, when possible, and new audio tracks will only be created if needed.